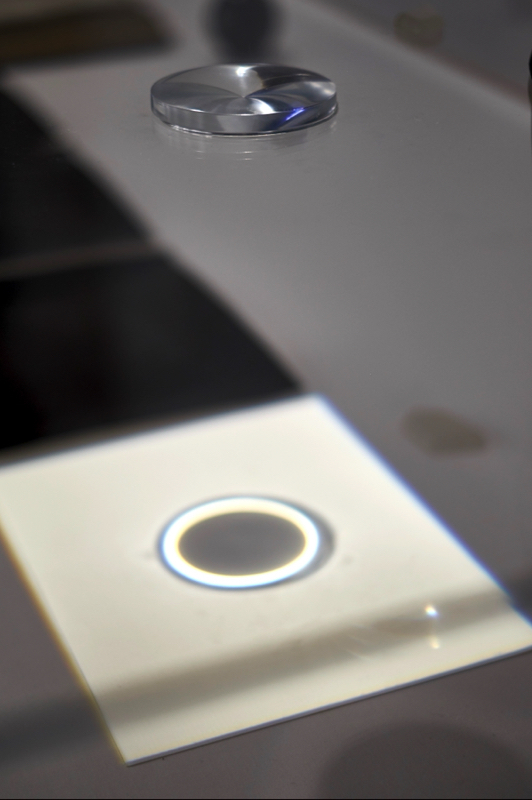 Prism, photographs, paper, aragonite crystals, black obsidian sphere and disc, spotlight, 2015. Situated towards the end of the exhibition 3 different nights, recurring, A past still to come is both a reference table for the exhibition and a storyboard for a future lecture-performance. 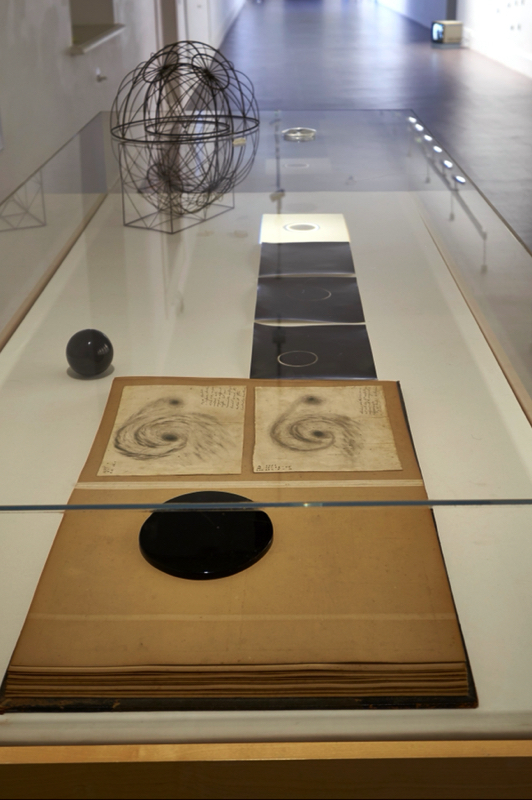 The exhibition title 3 different nights, recurring references a note made on a drawing of a galaxy by William Parsons in the mid-1840s. Using the Leviathan telescope he built at Birr Castle, William Parsons was the first to discover the spiral nature of galaxies. In an age predating photography, Parsons repeated his drawings over three nights in order to prove his observation. Interested in the moment before definition, A past still to come explores the dynamic of practice and representation and the levels where identity and time coincide. 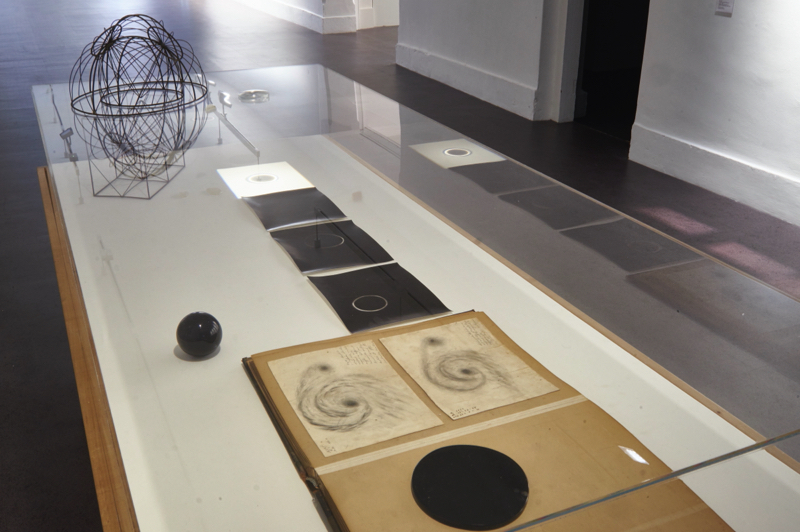 Displayed alongside the drawings, a sequence of three photograms are shown of circles of light, made with a prism. 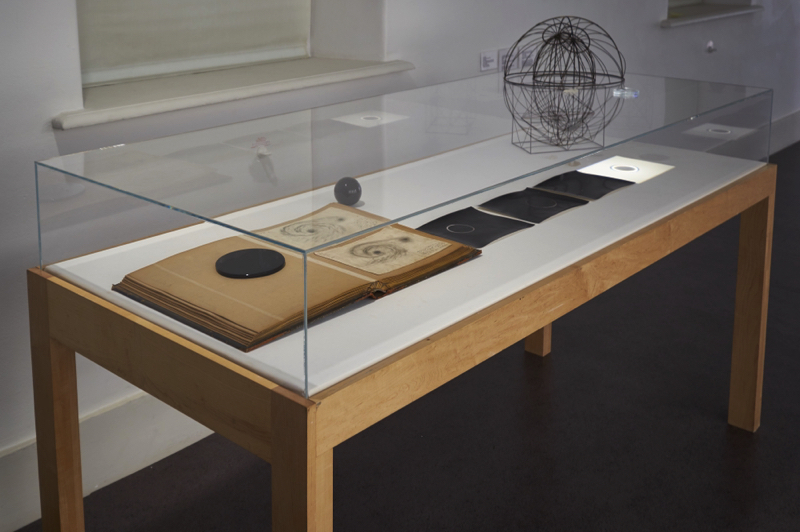 Creating a dialogue between the conceptual and the material, an additional print is not made, the prism resting on the vitrine’s surface, reflecting a circle of light through to the paper below. 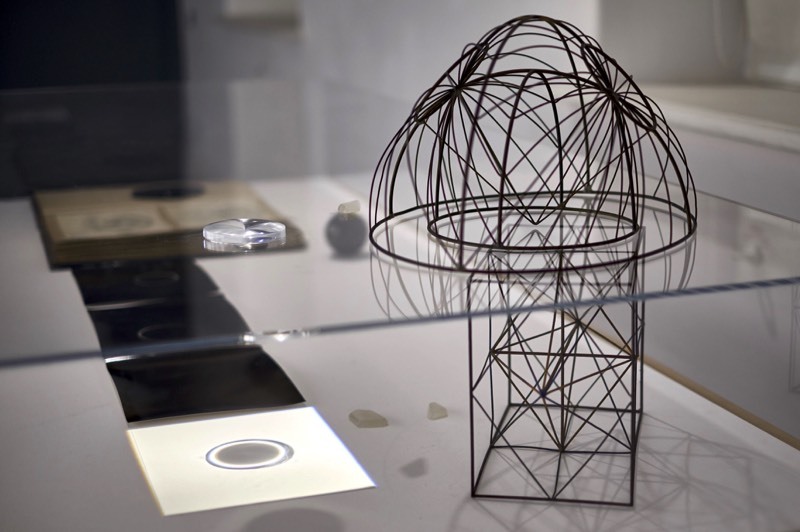 The circle of light is accompanied by two 19th century wire models, whose makers are uncertain; one of the structure of a biaxial crystal and the other, a model of the corresponding light wave emerging from it. When a ray of light enters a biaxial crystal, such as aragonite in a certain direction, the light spreads out as a cone inside the crystal and emerges as a hollow cylindrical beam, creating a circle of light on a surface. This curious effect was predicted by William Rowan Hamilton and proven by Humphrey Lloyd, contemporaries of Parsons in 1832 in Trinity College Dublin, and furthered the wave theory of light versus the theory of light as a particle. 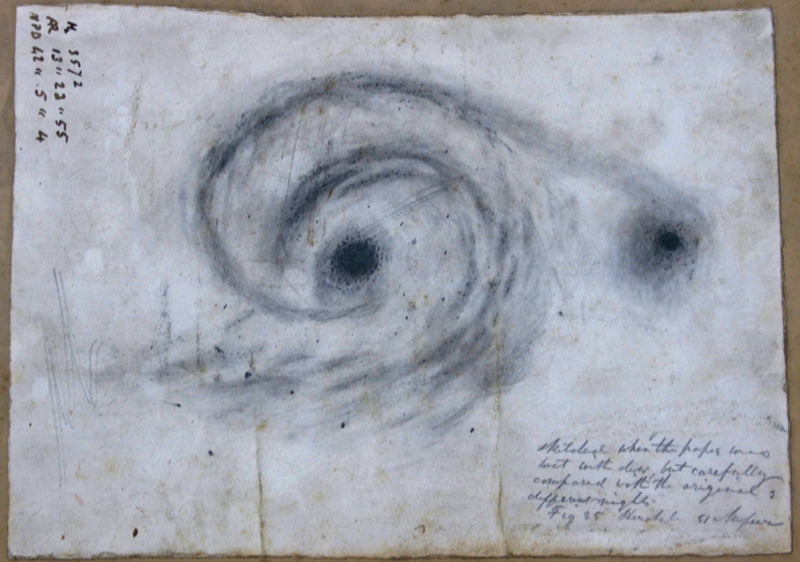 Sir William Parsons, Whirlpool Galaxy Sketch, mid-1840s. Courtesy of Birr Trustee Company, The Birr Scientific & Heritage Foundation. Pencil on paper, 30 x 40 cm. His drawings are reported to have influenced Van Gogh’s ‘Starry Night’, as the drawings were reproduced by Camille Flammarion, a French writer who popularised Parson’s vision at the time.